Monday April 29th 1901 Ida and I went over to Mr Vandenburgs for strawberry plants this forenoon. Got the dinner after we came home and I worked on a dress I was fixing for her. Tuesday April 30th 1901 Did churning and the regular work in the forenoon and sewed in the afternoon. Ida and I put out one row of raspberries and one of strawberries tonight. Wednesday May 1st 1901 We worked in the garden till nine oclock. Then did baking and got the dinner. I sewed in the afternoon and before night put out three rows of strawberries weather very warm for the time of year. 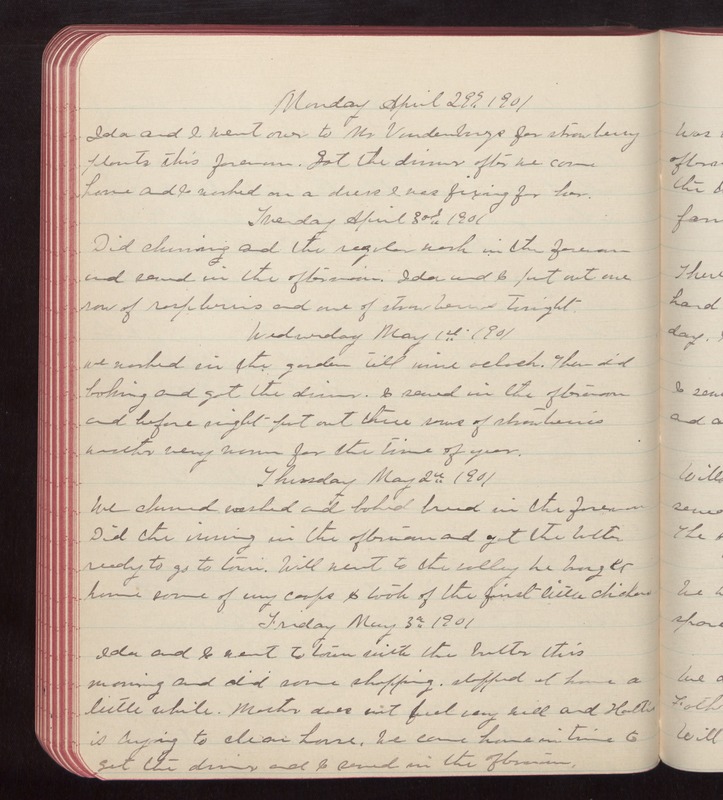 Thursday May 2nd 1901 We churned, washed and baked bread in the forenoon Did the ironing in the afternoon and got the butter ready to go to town. Will went to the valley he brought home some of my coops & took of the first little chickens Friday May 3rd 1901 Ida and I went to town with the butter this morning and did some shopping. stopped at home a little while. Mother does not feel very well and Hattie is trying to clean house. We came home in time to get the dinner and I sewed in the afternoon.